Greetings. My name’s Luke. I’m one of the co-curators of the monthly Third Eye Cinema series at the Northwest Film Forum. On Tuesday, August 7th, 8pm, Third Eye presents experimental film & video artist Brent Coughenour’s portrait of the city of Detroit, I PITY THE FOOL. Unspooling a series of seemingly incidental moments – a surreptitious motel rendezvous between two men; the demolition of a trailer park that uncovers a secret stash of illicit films and photographs; the casual wanderings of a unnamed character through the derelict corners of urban Detroit – the film’s focus gradually expands to take in the vast physical and mental zones of a city undergoing spectacular disintegration. Undertaking a kind of archaeological search for things nearly recent and long past, I PITY THE FOOL attempts to re-capture the marginalized and defiantly minor histories of its forgotten tenants. Simply put, Brent’s film makes you want to know more about this most fascinating and tragic of American cities. It leaves you wandering and indulgently lost in it’s labyrinth of possible outcomes. Brent will be personally on hand to present the screening of I PITY THE FOOL, his visit to Seattle a part of a larger self-organized film tour of the West Coast. In fact, many of the filmmakers that we invite to show at Third Eye Cinema also make sure to hit a number of screening spaces, galleries, and media centers while traveling through the Pacific Northwest: venues such as Cineworks in Vancouver, Canada; the Department of Safety in Anacortes, WA; DIVA Center in Eugene, OR; 40 Frames and Cinema Project in Portland, OR; and of course Third Eye at the Northwest Film Forum, are the few screens that continue to show truly independent artist films and videos. And by altogether bypassing the usual commercial film distribution channels (including fee-gobbling film festivals), this type of itinerant do-it-yourself distribution system allows filmmakers like Brent to bring their work to an audience directly. At the screening folks can freely grill the filmmaker with questions, hang out afterwards, and swap work with one another, creating a network that has the potential, however temporarily, to produce an exchange of ideas, support and community. On the heals of a fascinating new essay in Harper’s entitled “Detroit Arcadia“, as well as a recent New York Times article on “urban explorers,” I PITY THE FOOL is essential viewing to anyone interested in, among other things, urban space, post-industrial landscapes, psycho-geography, found objects, DIY filmmaking, super 8, experimental narrative, and radical film form. So drop in to Third Eye Cinema this coming Tuesday night at 8pm, and check out this singular new film. LS: Like the pieces of a puzzle, I PITY THE FOOL gradually accrues more elements as it goes on: fragments of narrative combine with other fragments that at first have no obvious connection. As opposed to story-lines in many feature-length films that gradually tie up and resolve their different threads, the focus of your film continues to broaden and expand, becoming more complex, open-ended and mysterious. What was the process of making the film: did you construct it gradually over time, or did you script it and have it figured out beforehand? BC: The ideas for the film came together over a long period of time. The original idea was something I started thinking about probably some ten years ago based on a news story I had heard about in Detroit. Basically I filed it away and kept mulling it over from time to time, but it was much more overtly “narrative” than what the film eventually became. Over the years I made a few other films, and I had several other ideas for possible films or projects. Then at some point, I think it was when I actually started to write a script for the original idea, several of these different ideas that I had been thinking about independently started to fit together into the same story. So I had a script and was starting to think seriously about trying to shoot it. This was probably the spring of 2004. Then some students of mine at the time turned me on to this abandoned trailer park, a visually stunning place, that to me was very evocative, and it seemed to fit in well with the other ideas for the story I had been working on. That was about the last piece to fall into place. So I started shooting, and then the trailer park led me to the letters and photos that became another significant thread for the film. The final version of the film is almost completely removed from the original ideas I had had, though, largely because over those ten years, I became much less interested in traditional storytelling and much more interested in the other things that films can do. LS: There’s a distinct tone and pacing to the film: scenes are filmed in either medium or wide angle, with few close-ups or cutaways, and most of the shots unfold over an extended duration. Overall, there’s more of a detached or observational, matter-of-fact perspective to the events. Yet, at the same time, the warm palette and graininess of the Super 8 reminds me of something more intimate and personal, like a home movie. Could you talk about some of the stylistic choices you made in the film? Why Super 8 for instance? And is this a method or a “style” that you’ve developed throughout your work, or does it depend on the project? BC: I can’t quite remember why exactly I chose super 8, except that it looks so fantastic. The previous two long projects I had done were on 16mm and DV, so I’m not necessarily tied to working in any specific medium. 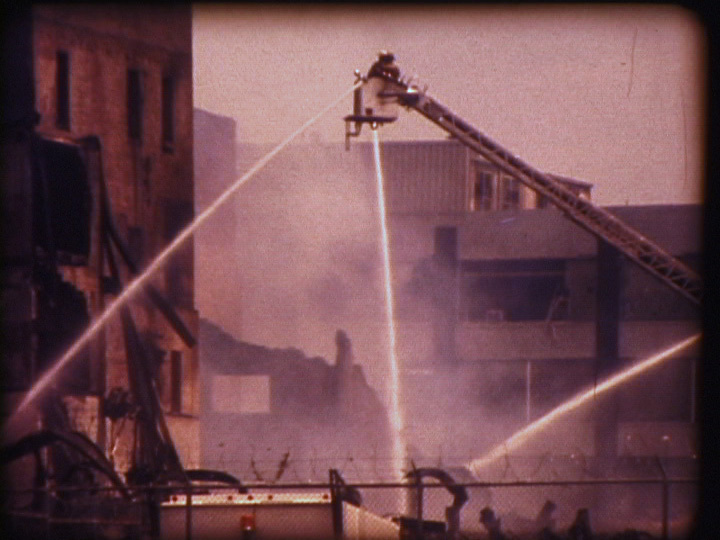 That may have been part of it–I hadn’t done a lot in super 8, just shot some occasional footage, but nothing very focused. I also felt I could afford it. I knew at the time that 16mm was out of the question for me financially, but I think it was mostly that I really liked the look I had been getting from playing around with transferring some super 8 to video. So to some extent it combines the best of both worlds, the grain and texture of film with the control and freedom of editing and manipulating the image digitally. Of course, you could shoot on 16 and edit on video, but that seems much less appealing to me, since you’re throwing away so much resolution. With Super 8, though, there’s really no way to finish on film anyway. When I started the film, I don’t think I was intending to work in the old Super 8 footage, but now that it’s there, that Super 8 look for all the footage is really important. There’s a sort of blending that happens, where the footage from 30 years ago looks almost identical to the contemporary footage. It helps to blur that distinction between past and present. As far as the observational style of the film, to some extent it depends on the project. With some shorter pieces that I’ve done, the camera work has been completely different. But when it comes to narrative, I’m very enamored with the idea of emotional distance-for a lot of reasons. One of them is that it parallels our experience as a film goer. The viewing experience is completely voyeuristic, yet most of the time narrative films are attempting to hide that fact, to make the viewers feel like they’re a part of what’s happening. It’s a lot of deception. As a filmmaker, you’re supposed to try to get the viewers to identify with the characters, to develop an emotional connection with them (through close-ups and what not), to care about them, because that’s supposedly the only way they’ll keep watching, but I think that’s a very cynical attitude to take toward the audience. And it’s really only necessary if you aren’t a particularly good filmmaker. There are a lot of films being made that only get people to watch them by tricking the viewer into sticking around until they’ve invested too much time to leave. I’d rather lay my cards on the table at the beginning and say, this is what you’re going to get, so if you’re not interested, you can leave now and not waste your time. What I’m really interested in, though, is creating authentic moments, moments that are rich and detailed, but also ambiguous, as is much of life. In order to do that you need to let time play itself out, to absorb the environment which is so critical to how that moment feels. You don’t need to know details or background information about the characters. You’re in a position where you have to look and absorb what’s there and then extrapolate what’s happening based on this basic information. It’s much more interesting to me to make and to watch this kind of film, because as a viewer, then, you have a much more active role in the construction of the film. It’s participatory. LS: One of the characters in the film is often heard reading a series of correspondences. There are also scenes where this is no image, only the sound of a voice describing a sequence of events, as if from a script. These voices, as well as the overall sonic textures in the film, seem just as important as the images. Clearly, you’re fascinated by sound. What led you to build your soundtrack in this way? BC: Part of my interest in sound stems from how it fits in with what I was already talking about in terms of creating authentic moments. Sound plays a critical role in that, specifically ambient sound. There’s a lot more music in this film than anything I’ve done previously (not that there’s a lot), but it was a bit of a struggle for me to decide whether it was appropriate since I really like the way ambient sound without music contributes to the authenticity of a scene. Putting music over something immediately takes you out of that moment as something real. You’re completely removed from the immediacy of that moment. It becomes a moment that’s being reflected back on. It’s mediated. With this film, though, I made a conscious effort to try to accept that convention of narrative filmmaking and to use all the varieties of sound that I could, as well as all varieties of sound/image relationships. The reason for that was primarily just as a formal element in the filmmaking process. Something like a game to play with myself. There are scenes with just ambient sounds, scenes with ambient sounds and music, scenes with just music, scenes without any sound at all, and scenes with sound but no image. Part of the reason for that last category, which you mentioned–the voice-over reading from the script–was also to play with the idea of cinema–typically considered a primarily visual experience–as an aural experience. It underscored for me the role of the viewer as creator of the film. I wanted to see if I could describe a scene in such a way that the viewers would create the shots in their minds. I liked the idea of visual information (and also sonic as well, since I describe some of the sounds the viewer would be hearing in the scene as well) coming through exclusively verbal means. I guess part of the process of filmmaking for me involves trying to see if I can successfully break as many of the prescribed methods of filmmaking as possible and still end up with an engaging narrative film. But ultimately the sonic textures are certainly as critical to me as the image. I’m very interested in the densities and timbres of the sounds and how they combine . Even with the speaking voice reading the script, I spent a lot of time crafting the specific nature of the sound of the voice to something that felt like it had enough texture that it didn’t need imagery but stood on its own. LS: While many big cities these days are experiencing resurgence, becoming denser and more popular to live in, Detroit continues to steadily implode, becoming more vacant and unused. I PITY THE FOOL dramatizes the fact that so much of Detroit is hidden, neglected, or lost. How has your film played to audiences from Detroit? What do you want to communicate to viewers who have no first hand knowledge of the city? BC: The film is unmistakably about Detroit in the sense that it’s such a vivid and unique landscape. And a big part of my interest in making the film was to capture all of these things I wanted to shoot and to see on film. But I can’t say that I set out to make a “Detroit” film. Personally, I see all of the issues that the film could raise about the post-industrial cityscape and all of the politics surrounding why Detroit is what it is as sub-text rather than any kind of overt gesture on my part. Partly that’s because the issues there are so complex, and I’m really not qualified to tackle them head on, and partly it’s because I’m more interested in the formal elements of filmmaking than I am in tackling issues. But ultimately, with images as surreal as what is in the film, it’s unavoidable that it would raise the question of “In what kind of city could these places exist?” “How does this happen?” and I do think those are important questions-questions I hope that the viewers might address on their own if they feel prompted to do so. So far, I’ve only shown the film to a few of my friends from Detroit, and they seemed to respond pretty positively in terms of how the film captures certain details and the types of questions it raises. I’m showing it in Detroit right before i head out west for this tour, so I’ll see what the response is then. LS: What do you see happening to Detroit in the near future? And do you plan on going back? BC: There’s certainly been a lot of speculation in Detroit about things turning around somehow, or at least there was before I left a few years ago. The Super Bowl in 2006 was supposed to be a big catalyst for this economic turnaround. Personally, it seemed to me at the time to be mostly wishful thinking and unsustainable. I couldn’t believe how many condos were being built downtown and how much they were trying to sell them for. Considering how few people actually live downtown, and how little of an infrastructure exists in that area, it seems like a market that has to implode, especially given the fact that Michigan’s housing market is really bad right now. However, I’m pretty pessimistic, so I might have a skewed perspective. That said, I’d love to move back to Detroit. I really love the city, maybe precisely because it’s in such bad shape. I don’t know. LS: The filmmaker Bill Brown (CONFEDERATION PARK, THE OTHER SIDE) is one of the actors in I PITY THE FOOL – he goes out and explores parts of the city and reads a series of letters off-screen. His role in the film – the way he witnesses or recounts the quiet and unique “moments” in the life of the city, both past and present – reminds me of the way he makes his own documentary films. It’s an almost archaeological way of looking at a place, collecting the intimate or “minor” histories that lie just under the surface of a landscape. What was it like working with Bill Brown? Do you and he share a lot of the same concerns as filmmakers? BC: Bill Brown is, I think, a much more knowledgeable and analytical filmmaker than I am. So where my concerns are probably primarily focused on the formal aspects of filmmaking and secondarily on content and ideas, his films seem to invert that relationship. In the year and a half that he lived in Detroit, he learned far more about the city than I had in a lifetime. He’s really interested in landscape and in the politics and the lives that a landscape reveals. I think we certainly share some common ground in the types of images and such that we’re drawn too, but where I’ll just absorb something, he’ll research and study and learn everything about it-probably a much more responsible approach. So that’s one reason why working with him was great, because I was able to swipe a lot of knowledge from him on the cheap. He’s also just a really fun dude to be around. LS: I have to admit, I’m still stumped by the title. I Pity The Fool? How come? BC: One thing that I like about the name is the way that it sounds so wrong the first time you hear it, but, for me at least, sounds better and better each time after that. Ultimately, though, I don’t have an answer for this question. This entry was posted on August 1, 2007 at 11:42 pm and is filed under Uncategorized. You can follow any responses to this entry through the RSS 2.0 feed. Both comments and pings are currently closed.